Arms feature a moving and locking design to hold televisions in place! Brackets adjust from landscape to portrait with ease! Aluminum stand fastens into desk for added security and safety! 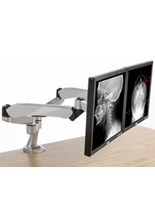 Multi monitor mounts, like these desk mounted display holders, are created with a dual bracket rotating design which enables users to situate dual TVs independently in horizontal or vertical layout! This characteristic is most treasured by those that read, edit or create content on a daily basis and require a solution to change the layout of the television in order to effectively use the digital screen! 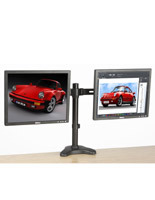 These eye-catching LCD display racks, multi monitor mounts that support multiple screens at once include quality articulating arms! Even though these multiple supports are movable and can be modified to display important materials in the best viewable angle, there are essential steps to follow before propping the screens! Prior to fastening a flat panel TV to each support stand, an M6 Allen wrench (included) must be inserted inside the top of the arm, the nearest end to the post. 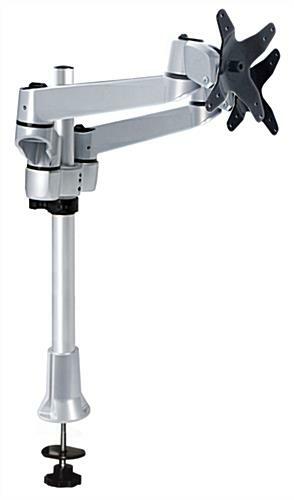 Insert the tool with the handle positioned outside the unit, rotate to the left about 2-3 turns. This step sets the spring-loaded coil in motion slightly which will allow for up and down movement once a flat panel is correctly fixed. 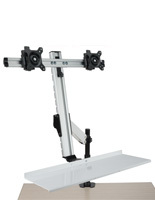 (Please Note: Arm adjustments must be made prior to mounting a screen to the bracket. Attempting to adjust the support while a TV is mounted to the unit may cause damage.) Today, businesses are beginning to look to resourceful ways to maximize potential in employees. 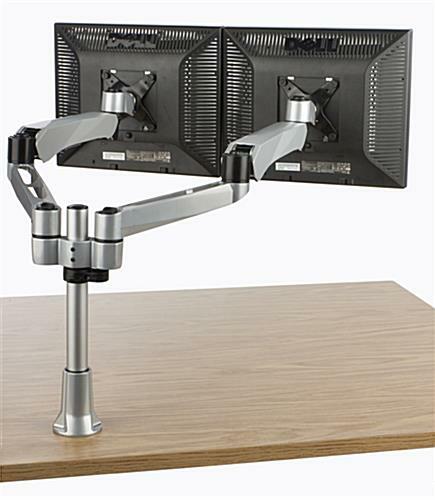 Although these multi monitor mounts feature a desk binding design, these stands provide an added element of security! When properly drilled and secured into a tabletop, the chances of these screens disappearing can be reduced! 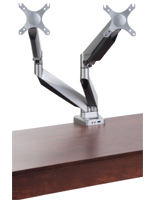 These flat panel holders, multi monitor mounts that stand 14-1/2" tall can be used in any type of setting for display and presentation purposes! Those who have purchased one of these well-crafted design racks have resourcefully fastened it to desk tops, counters and tables at all sorts of venues! These holders for multiple screens, multi monitor mounts that can be positioned near a wall to help to best utilize small tables that stand alone or confined cubicles! 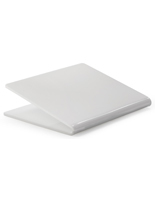 Airport check-in areas, offices, retail establishments, medical laboratories and other settings have all fastened this stand configuration onto level surfaces for display! Multi monitor mounts are a solution for capitalizing on desk room and can also be a way to raise overall productivity in a company! When users no longer have to minimize programs and windows constantly, the output of finished assignments has the potential to increase at a faster rate! 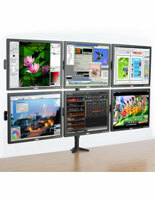 Multi monitor mounts that hold multiple screens at once are an ideal purchase for just about anyone that respects a cost-effective, efficient dual plasma holder design! 52.0" x 14.5" x 3.1"